I went to France for 2 weeks in 2006, which makes me uniquely qualified to discuss lespâtisseries viennoises, entremets, and baguettes. I see myself as a cross between Mary Berry and Pierre Hermé. When I heard Nathaniel Reid Bakery opened in Kirkwood, I wanted to make sure he knew who he was dealing with. I showed up looking Parisian as hell in my black and white striped shirt, tight black pants, and smug attitude. I peppered the staff with important questions, like where is your beurre from and do you have free samples. I don't want to brag, but they know me there now. I've gone to Nathaniel Reid Bakery (NRB) close to 10 times now, I think. "Stop eating so much sugar and butter," my doctor would say if I had health insurance. But I do this for you people. I needed to try as much as I could so I could soundly recommend items. My altruistic, selfless nature never ceases to impress me. When you walk in, before you even look at the display case, head to the far wall, a Willy Wonka-esque treasure trove of chocolates, nougats, caramels, meringues, chocolate pearls. The last two are perfect for prettying up that pathetic attempt at a cake you just made for your kid/spouse. My two favorite jarred goodies: the Spiced Caramel Spread and the strawberry-poppy flower jam. I'd never had poppy flower before (I hoped it would give some sort of opium buzz, but all I got was hyperglycemia), which I found out taste just like cotton candy. And I secretly love cotton candy. If you'll kindly turn your head to the right, you'll see the display case. This is what you came here for. Colors. Glazes. Shapes. Ooh. NRB typically has 6 to 8 types of macarons in their case, each with a pronounced flavor but a texture that's fairly different than La Patisserie Chouquette's. I don't know if one is more French than the other because I didn't eat any macarons in France during that trip a decade ago. I would happily eat both, Nathaniel's in my left hand, Chouquette's in my right. The viennoiserie options vary depending on the time of day, what's in season, etc. What I'm trying to say is that you might see a picture of an apple pastry today, but next week, when you go, it'll be pear. And you'll inevitably tweet at me about it, whining. You snooze, you lose. If you're a NRB rookie, grab an assortment of breakfast pastries. Below, you'll see their pecan cinnamon roll, a croissant, and the love of my life: their twice baked almond-chocolate croissant. The croissant, decked out with dark chocolate, is sliced open and slathered with almond paste, topped with more chocolate, then baked until extra crispy. I like to bite into it while staring directly into Nathaniel's eyes and tell him "good bake" a la Paul Hollywood. I've been watching a lot of Great British Bake Off lately. NRB has delicious sandwiches (and salads, but salads are too healthy) available for lunch, with my favorite being the roast beef. It's a simple sandwich, the kind I'd buy on my morning stroll back when I was living in France for those two weeks, made with tender roast beef, slivers of red onion, a slice of cheese, and horseradish aioli. Though, to be honest, it's the bread that wins me over: brioche (aka butter) bread with a sprinkling of shaved parmesan on top. Molto Bene! as the French say. 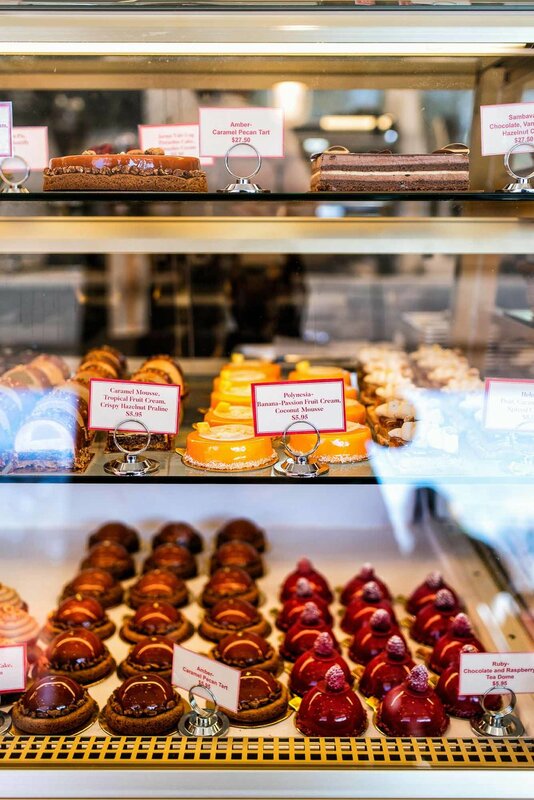 Where NRB really shines is with their entremets, also known as "them fancy cakes" if you're from St. Charles. Reid's creations are incredible, undoubtedly some of the most delicious entremets I've ever had. And the detail work that goes into ever component is mind-boggling. Here's the recipe for the Amber cake below. Are you going to attempt that at home? I didn't think so. He's so good, in fact, that the Nathaniel Reid you see in the picture below isn't even him. That's 6 feet of spun sugar. He's that good. Almost all of the entremets are available as full sized cakes, or in miniature form. The Amber is all about pecans and caramel. For something more tropical, the tangerine-colored Polynesia is a banana-passion fruit cream and coconut mousse cake. Not pictured, because I ate it without thinking, is the Sambava, a mix of chocolate, hazelnut and vanilla. My current favorite, being that I'm addicted to pistachio, is the Jarmo pistachio cake with a berry gelée and pistachio cream. Before we go, I have to give special kudos to Señor Reid, for he has done the impossible. 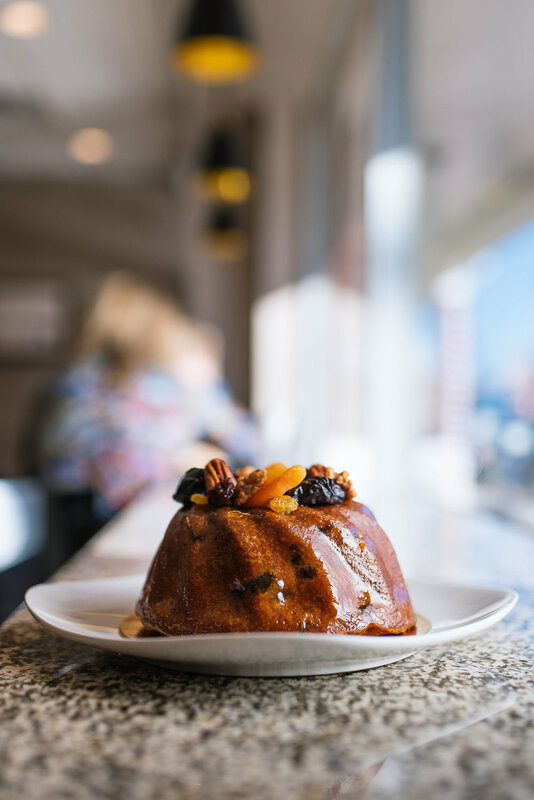 He has taken up the challenge of improving the much maligned, oft ignored fruit cake and turning it into something people actually want to eat. I guess opening a bakery and having a baby in the last 4 or so months wasn't hard enough. I'm pleased to say that I enjoyed his fruit cake, which he tells me took nearly 7 years to perfect, immensely. It doesn't feel like you're eating a spiced brick, thanks in part to a proprietary technique he developed. He soaks and candies all the the fruits and nuts himself. It's a labor of love and you can taste it. I know it's hard to believe, but your friends and family will actually thank you for bringing it to their [Insert Holiday] party.